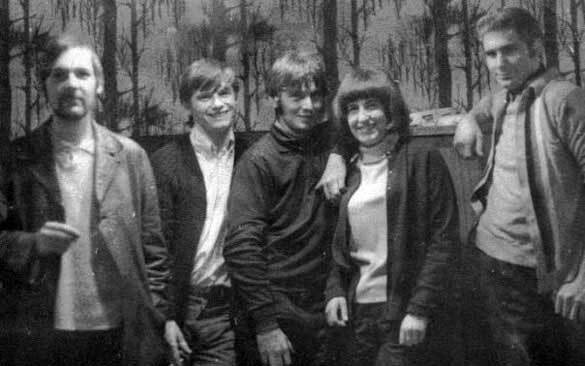 The Milestones at The Grove, Middlesbrough in November 1965 shows Trevor Middleditch, John Nimmo, Kathleen Davies at the front, Ian Naisbitt and John Price. The Milestones, from Middlesbrough, were a bit like an Animals tribute band and had a residency every Tuesday night at The Grove, Easterside, in Middlesbrough. 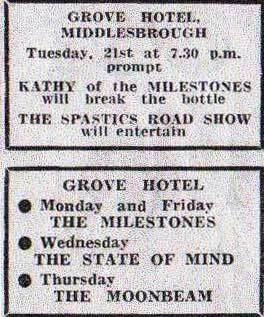 The Milestones at the same venue - The Grove, Easterside in Middlesbrough. 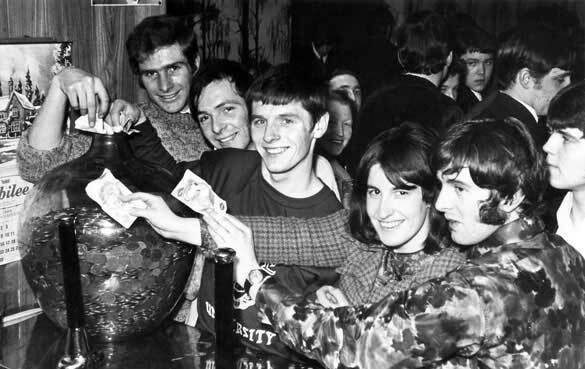 They each placed £1 in the pot for a local charity. Probably their night's fee? It just shows you how old this photograph is because they had pound notes back then! 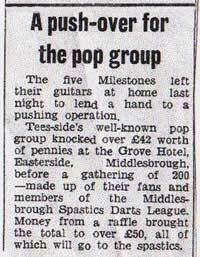 Also at The Grove, Easterside - probably on the same charity night. 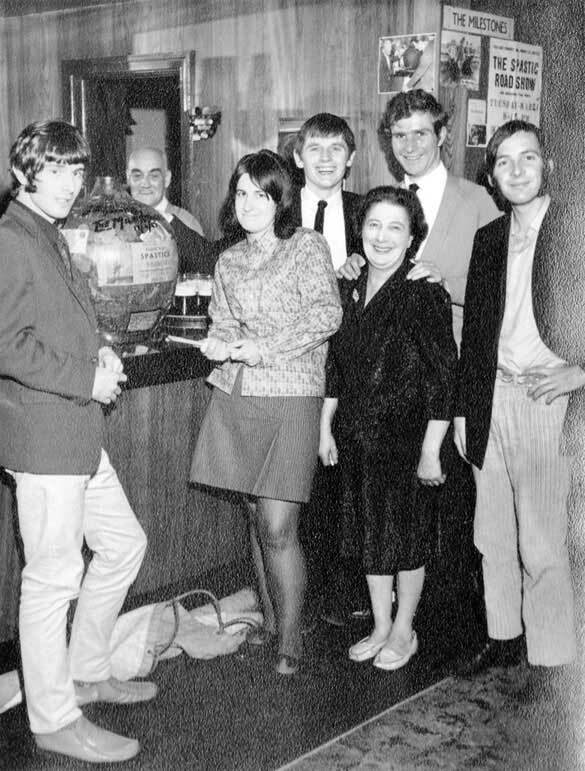 This shows Trevor Middleditch, landlord Claude behind the bar, Kathleen Davies, John Price the lead vocalist, landlady Addy, John Nimmo and Ian Naisbitt. The Milestones pose for this photograph - again taken at The Grove in Easterside, Middlesbrough. From the collection of Trevor Middleditch of The Milestones. He believes they are playing here at South Bank Social Club. This was after Kenny Payne, the bands' first drummer had left, and Graham Rex joined them for a short spell. Ian Naisbitt remained until Norman Smith arrived until they disbanded. Trevor Middleditch with drummer Norman Smith at the Eston Play Week Amateur Beat Contest. 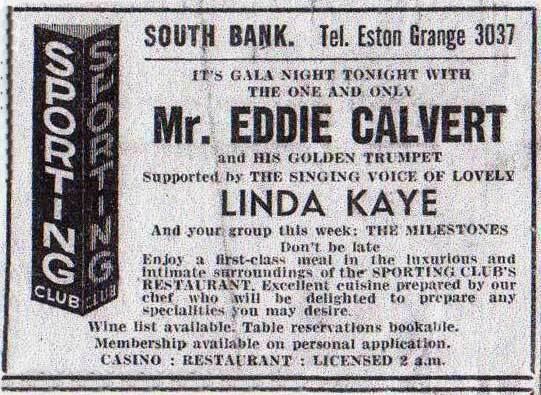 There are more details about this event in a press cutting in the right hand column. 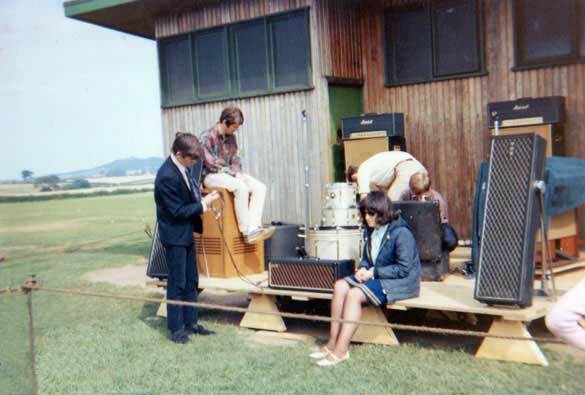 The Milestones also at Eston with Johnny Price in the dark suit, Trevor Middleditch sitting on the speaker, Kathleen Davies (seated) who played the Hammond organ, John Nimmo and Norman Smith in the background. Thanks to Trevor Middleditch and Ian Naisbitt for the photographs, Ken Payne for additional information and Paul Delpanque for the extra publicity. Trevor would also like to give credit on this page to The Milestones' manager & roadie Ray Peart. He was such a lovely guy who provided the van and loyalty and attended all our gigs. 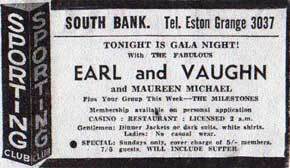 More advertising from South Bank Sporting Club and this time providing support for Eddie Calvert and Earl and Vaughn. Nev Henderson, of The Delmonts writes: I have a few memories of The Milestones. 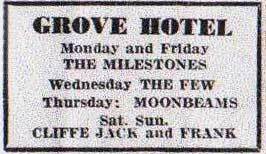 We used to play every Wednesday night at The Grove at Easterside and, if memory serves I think that they played every Thursday. 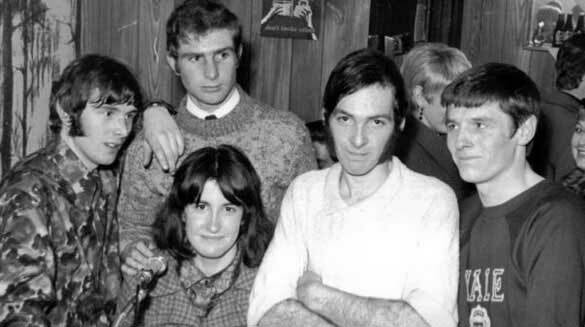 I probably knew them all at the time - Ian Naisbitt joined us later on. Hope this helps. By the way the landlord and landlady of the Grove, as shown in one of the pictures, was Claude and Addy and, believe me, you never wanted to fall out with Claude, a jovial chap usually but a real feisty Scottish hard case when necessary. Thankfully we always got on well with them. 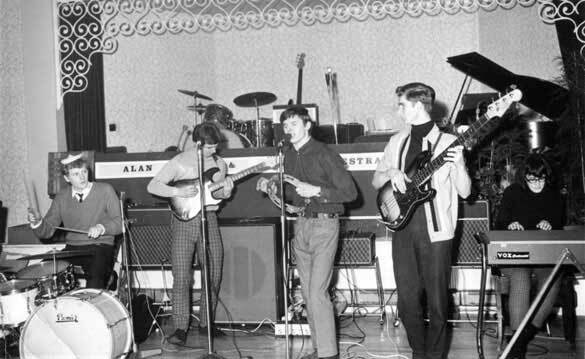 More on The Milestones from John Taylor: When the Milestones split in 1967 John Nimmo with Norman Smith advertised for new band members and our band Soul Supply had just split when Mick Martin (guitar), Jeff Tisbury (bass) and John Collins (drums) left to form Denver Mule with David Coverdale. Myself on Trumpet, Rob Atkinson (tenor sax) and Paul Cattermole (vocals) answered the advertisement and got together with John Nimmo and Norman Smith. We needed a guitarist and recruited Wally Latheron and our ex-Elastic Band keyboard player Barry Robinson. The first photograph on the Chelfont Line page is the lineup that started gigging. I unfortunately have no photographs of Ian Naisbitt with the Chelfont Line. Photographs on this site are © copyright to their respective owners and are not to be downloaded, or printed, for private use by individuals, organisations or social network sites. By viewing a digital image from this collection, you are agreeing to comply with copyright licensing regulations. These state that you will not copy, publish or distribute the image in any way. Please note, we have made every effort to ensure that copyright is not breached. 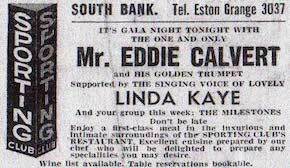 Some press cuttings relating to The Milestones and their many shows. 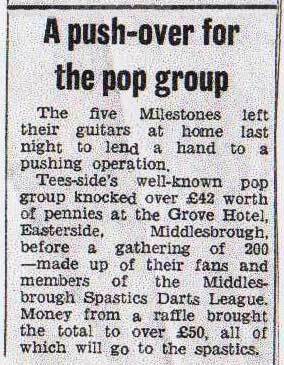 This newspaper cutting refers to the second photograph down in the main body of the page when the band knocked over a pile of pennies to help raise money for charity. 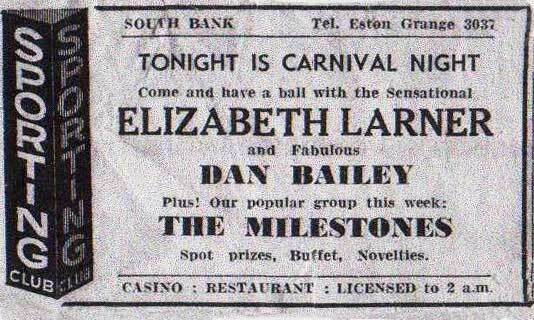 Tonight is Carnival Night says the advertisement with The Milestones supporting Elizabeth Larner and Dan Bailey at the Sporting Club, South Bank. 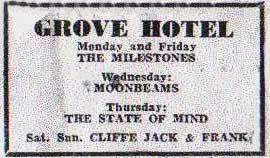 A Grove Hotel advertisement with The Milestones appearing on Monday and Friday. More from The Grove Hotel in Easterside, Middlesbrough. The Milestones are triumphant winners of Eston Play Week's first ever Amateur Beat Contest. The Google monkey above was created by Dave Sutton graphics and free 3D animated gifs for web sites.